I believe P. cerulea is even more cold-hardy than P. incarnata, but very close. I believe P. incarnata can withstand negative temperatures Fahrenheit. Google can tell you for sure. P. caurulea is the hardiest Passiflora.....Maypop is little less hardy !! The main problem is the cold together with wet......in dry winter it will survive lower temperature. Passiflora incarnata is hardier than passiflora caerulea. It is supposed to die-back to its roots in Autumn. It is a naturally deciduous passiflora in many temperate climates. I have grown them for many years. I managed to find a slew of native passionfruits on a trip to southern Illinois not long ago. The vines were fairly prolific, and I kept a bunch of seeds. I would describe the flavor as tangy and citrus-y, but quite sweet with a floral note. Very tropical tasting - about the last thing I would expect from a plant growing right next to a soybean field. If anyone is interested in trying to grow these things, let me know. Maybe we can arrange to trade for something. I am always interested in wild collected seeds! Please send me PM! Good luck with the seeds - let us know how you fare. There is a lot of inconsistent information on the internet about how to germinate these seeds. Some say to scarify, some say to stratify (not many), etc. I recently germinated several maypop seeds. How many years do they take to fruit? I don't remember if it fruits the first year, but definitely by the second year. Make sure you have plants from 2 or more seeds so they can cross pollinate. Can you describe exactly what you did to germinate them? Did you stratify and for how long? What medium were they planted in, what conditions etc? How long did they take to germinate? As mentioned, there seems to be a dearth of solid info online about this, and what little info there is is contradictory. 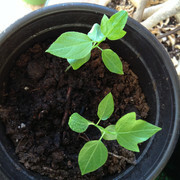 I purchased these seeds from Tradewinds fruit about a month ago. I am not sure if they were pre stratified. I kept them in an organic potting soil on a heating pad which is placed on top of a rule with a heater under it. I think that the extra heat really helped. I was also able to germinate a few seeds of Passiflora quadrangularis. They were packed for 2016 so maybe freshness was a success factor? Interesting! How long did it take to see shoots emerge? The seeds sprouted in a little over a month. To those of you interested in my So. IL maypops (P. incarnata), I have decided to stratify my seeds for approximately one month before germinating a test batch to assure their viability. I will feel better about sending these out to interested parties once I know that they will sprout. I apologize for not checking up on this website more regularly. I cannot say for certain, but I suspect these seeds were not pre-stratified. Based upon my experience with pre-stratified Pawpaw seeds, pre-stratified seeds are most likely going to be labeled as such and will also be substantially more expensive than non-stratified. In about 3 weeks, I hope to have germinated a few seeds of my own and hope to be able to add to the seemingly depauperate knowledge base on growing these plants. Good luck with your seedlings. Thanks, googer. definitely keep us posted. I have a couple weeks until I try to sprout my seeds. After a flash-stratification of five weeks, I have a handful of P. incarnata seeds planted in potting soil on a toasty (~75 F) heating pad. I'll let you know if anything's happened by January 30th. Nice! I was actually just reading this thread earlier today and wondering how you were progressing. What prompted you to sow now? Anything in particular? I was trying to decide when to sow my seeds. I just installed a Sun Blaze 44 fixture and got a couple heating pads. I didn't want to start the seeds too early since in the wild they are very late emerging. But not sure that matters. After seeing how easily Sildanani was able to germinate his P. incarnata, I wanted to see if I could get away with only a month of stratification (most plants need 3-4 months). I've got a few folks interested in the seeds I collected and I wanted to make sure that what I've got is even viable and I'm trying to gauge the germination rate. Also, it's something to tide me over until my first batch of Pawpaw seed finishes its stratification at the end of the month. I have some updated photos of my seedlings. I am curious of if it would be safe if I plant them in the ground this spring. 7 of the 10 seeds I purchased sprouted. That's a good rate I guess. Btw googer, I am a girl lol. I don't see why you couldn't plant them out this Spring. Definitely not until there is zero danger of frost. This is not based on experience, just my thoughts. I finally sowed 6 seeds I kept from a fruit off my white maypop vine. They have been in the fridge in moist whole sphagnum since September 25. 3 I sowed right out of the fridge and 3 I soaked overnight. I have them in a flat with heating mat. Temp is 77 degrees. Will keep folks posted. Wellllll those seeds i planted got cooked by the heat mat I think. I went back and measured the soil and it was something like 95 degrees. I am gonna keep these around to see what happens but my expectations are low. I am starting some new seeds today. Question for sildanani and googer - did you pre-soak your seeds? That's crazy, the exact same thing happened to me. I left the heating mat at what I thought was a reasonable setting overnight and woke up to find my maypops in a sauna. I've left them in the container but I seriously doubt that they're viable so I too am starting from scratch. I did another batch of 10 - 5 unsoaked and 5 soaked. Haven't bothered scarifying them as I've read that might make the seeds susceptible to mold and many sources say they don't need it. We'll see what happens. I bought a heat mat with a dimmer because I anticipated that it would be really easy to cook seedlings. Even so, I just can't keep this mat in the 75-85 Goldilocks zone - it's either baking or freezing. Anyone have any tips on keeping this thing at a stable temp? I need to iron the kinks out of this heating issue and fast because my first batch of pawpaw is going to finish its stratification next week. I got 2 "Apollo" heat mats from Amazon. They have decent reviews. I saw mention of stand-alone thermostats that could be used in conjunction, to modulate the temp. But many reviews said they were unnecessary and I didn't want the expense. So my answer for the moment is a stack of Hardy Boys books to keep the tray about 3 inches above the mat. I soaked them for 24 hours in warm water prior to planting them. After giving my container a bit of water, I couldn't help but poke around in the soil. Sure enough, I saw one of the seeds has sprouted! I think it was one of the ones from the first batch, which I had all but written off as lost; but I suppose it is also possible that one of the seeds I planted two days ago already sprouted. That means that either P. incarnata is much more tolerant of radical temperature changes than I anticipated, or that the seeds can sprout very quickly under optimal temperature (75 F/24 C). I suspect the latter is the case, so I would keep a close eye on your first batch of seeds Triloba Tracker! I will keep you guys posted as other seeds come up and try to have a success ratio within the next week. Otherwise, I'm chalking this one up as a success. Those of you who were interested in these seeds, I'll reach out to you again and arrange sending a few out to you. The coincidence continues! I just checked my first "cooked" batch and they are sprouting right up! Are your sprouts the ones that only got a few weeks stratification?